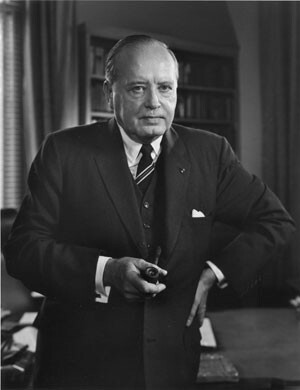 A Columbia University professor and provost, Grayson Kirk was elected president following Dwight D. Eisenhower’s departure for the White House and officially installed on June 2, 1953. Kirk’s presidency was marked by City and State approval for the building of a gym in Morningside Park (1960), the active recruitment of black applicants at both Columbia College and Barnard College (1964), the founding of the School of Arts (1965) and the emergence of several student groups including the Students' Afro-American Society chapter (1964), Students for a Democratic Society (1965), and the Student Homophile League (1966). Despite these accomplishments, Kirk's tenure as president was rife with conflict. Opposition to the war in Vietnam and dissatisfaction with Columbia’s relationship to the Harlem community reached a head in April 1968. Students occupied five campus buildings in protest to the alleged racism inherent in the plans for the Morningside Gymnasium, Columbia's involvement with the Institute for Defense Analysis, military recruitment on campus, and bans on indoor demonstrations. Kirk was accused of mishandling the situation on campus (especially by calling in the NYC police to "bust" the occupied buildings) leading to calls for his resignation to which he finally complied in August 1968. After leaving Columbia Kirk held positions on the Council of Foreign Relations and the Association of American Universities.